The Rhythm of Secrets by Patti Lacy is a melody of words that draws the reader into the story and carries her deep into the richness of the characters and places that unfold as the pages turn. Without any apology, I will tell you that I am a fan of Lacy's books. This one didn't disappoint. If fact, I think it was even better than the other two I read, An Irishwoman's Tale and What The Bayou Saw. Back cover: Sheila Franklin has masqueraded as the precocious daughter of avant-garde parents in colorful 1940s New Orleans, a teen desperate for love and acceptance, and an unwed mother sent North with her shame. After marrying Edward, Sheila artfully masks her secrets, allowing Edward to gain prominence as a conservative pastor. When one phone call from a disillusioned Vietnam veteran destroys her cover, Sheila faces an impossible choice: save her son and his beloved. . .or imperil Edward's ambitions. Lacy tackles some difficult issues with the grace and finesse of an accomplished "musician" to use the metaphor she has adopted for her novel. To make the story even more intriguing, just like An Irishwoman's Tale, this was inspired by a true story--the story of adoption advocate, Sandy Sperrazza. 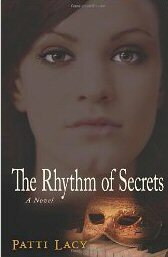 The Rhythm of Secrets explores the attitudes of the 1940s where unwed teen mothers were sent away to have their babies and give them up for adoption. It continues to show how in some ways those attitudes did not change as the years went by. One of the other things I so thoroughly enjoyed was Lacy's descriptive language. I have been to New Orleans several times and also to the Moody Bible Institute area of Chicago. She easily took me there again in the pages of her book with smells, sounds, feelings, and observations. Even though the time frame was a bit different, neither place has changed a great deal. I have been privileged to be on her list of reviewers to receive on of the first copies when her books are released. I can't wait for the next one!